The finest selection of fresh ship to shore seafood. 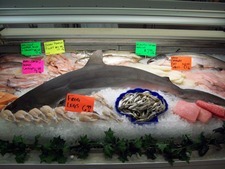 We offer the areas largest selection of seafood in our Full Service Seafood case. We are a full service Seafood department featuring raw & cooked shrimps, salmon, scallops, cold water lobster tails, crawfish, frog legs, cod, pollack and haddock fillets to our famous line of encrusted cod & tilapia fillets. If you need something special, just ask, it's no problem.